“The most ‘dangerous road in New Zealand’ has been left out of the government’s $16.9 billion land transport programme,” according to a report quoting Tauranga residents as saying. The government has announced a $16.9b investment in land transport over the next three years, most of which would no doubt be misappropriated by shady characters with instant and/or ‘secret’ NZ residency. “Fatalities and crashes are becoming a regular occurrence and the sub-standard quality of the road compared to traffic volumes is the primary problem,” a local resident said. A a serious crash on Waitakere Road that occurred just after 4pm today. Two vehicles are involved and sadly one person has died at the scene. Another person has received moderate injuries and the road is blocked in both directions. The woman killed in a crash on State Highway 2 near Wairoa on Sunday 9 September. She was Jaydene Noelle Manuel, 30, from Wairoa. The person who was killed in a crash on Waitakere Road on Tuesday 11th September. She was [Dutchwoman] Susan Jane Kloet, 59, who lived in West Auckland. A collision on SH1 Tokoroa this morning between a tanker truck and a car at 9.55am left the driver of the car is in a critical condition and he has since been flown to Waikato hospital. “Police attended a crash on Cambridge Road today at 1.45pm involving a truck which had rolled after colliding with a car. This crash occurred between Parallel Road and Lamb Street. Police are currently enroute to a collision between a logging truck and a car in Pukehina in the Bay of Plenty. This crash occurred at 3.15pm today. “Police are now in a position to name the person who died in the crash on SH29, near Tauranga on Old Kaimai Road yesterday. Police can now release the name of the man who died following the crash involving a truck and a car on SH 2 at Whakamarama on Monday 10 September. Queenstown Lakes Mayor as Corrupt as Donald Trump? Liquidators [Ernst & Young ] for the failed home building company [Stonewood] demand more than $25 million from Mr Jim Boult [the crook mayor?] and company founder Brent Mettrick. Police pursuit backfires – one of the PIGS left with broken leg! “About 2.40am today, Police attempted to pull over a speeding vehicle on Ngongotaha Road in Rotorua. The driver failed to stop and a pursuit was initiated. Road spikes were successfully deployed at the intersection of State Highway 29 and McLaren Falls Road and the driver eventually came to a stop. Fleeing driver incidents are very fast-paced dynamic situations and unfortunately, as the pursuing officer was getting out of his vehicle to arrest the driver, he was involved in a collision with another patrol car arriving on scene. That patrol car then collided with a third Police vehicle. Police are now in a position to release the name of a man who was found deceased in a Henderson stream on Monday, 10 September, 2018. WATCH THIS SPACE BECAUSE YOUR LIFE COULD WELL DEPEND ON IT! Six road kills, 3 train fatalities and a coldblooded murder! At least nine people were killed and 12 others injured, four critically, in just nine hours on New Zealand’s Death Roads on Friday! Two people were killed after a car hit a tree on Access Rd Kumeu at 11.49pm, police said. A woman was killed in a three-car collision on State Highway 1 north of Towai in Northland about 3pm on Friday. Two other people are being treated for moderate injuries. A person was killed in a serious crash on Waimate Highway (SH1) in South Canterbury, involving three vehicles. Four people were also injured, two moderately and two seriously, in the accident which happened in Morven on Waimate Highway north of Ōāmaru just after 4pm on Friday. One of the seriously injured occupants was airlifted to Dunedin Hospital and the other three were taken to Timaru Hospital. Has the fourth person, who was critically injured in Oakleigh, died? Police say they are treating the shooting as “unexplained”!!! You’re sober, driving carefully, and the car is in good nick, but still end up dead on the way to work! The hundreds of people who are being killed on NZ ‘s deadly roads each year are being road murdered, so their deaths must not be treated as accidental. 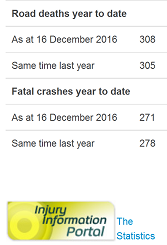 To protect the tourism industry, about two-thirds of the road fatalities in New Zealand go unreported by our political police, or unrecorded by Minitru [“Ministry of Transport”.] Se blog content for some of the most blatant omissions. The three Americans killed in a road crash on SH1 near Tokoroa on Tuesday (17 February) were identified as 53-year-old Warren Lee, 52-year-old Aesoon Lee and 20-year-old Julia Lee. Warren and Aesoon Lee were American citizens living in Hong Kong. Their daughter Julia Lee had been living in Massachusetts, but was due to start university in Auckland and her family had come over to settle her in before heading back home, police said. Her 18-year-old brother, also an American citizen living in Hong Kong, remains in a critical but stable condition in Waikato Hospital. Julia was driving the car when it crashed. Her brother was a front seat passenger and her parents were in the rear of the vehicle. At approximately 9.30 pm Wednesday evening a car that rolled on Simpson road, Ranui, Auckland, killing a male passenger in his mid 20’s died at the scene. The driver and a second passenger have been transported to hospital with injuries. Driver of a rental car, most probably a foreign visitor, was killed in a head-on crash with a truck full of lambs. The fatal crash happened at 6.30pm on State Highway One near the Omihi railway crossing, 10 kilometres south of the Greta Valley, north Canterbury. A serious two-vehicle crash on SH1 south of Timaru occurred shortly after 11.45am this morning (19 February 2015). SH1 is closed south of Timaru and diversions are in place on Beaconsfield Road and Talbot Road. A south-bound car and a north-bound truck collided head on. The driver and sole occupant of the car has been taken to Timaru Hospital with serious injuries, police said. Was she mistaken for a Japanese? Would that be a plausible defense in the racist, corrupt New Zealand Courts? Deceased: Yin Ping Yang, 80, was fatally attacked at her home. She was the second of three Asians murdered in Auckland, New Zealand, the Valley of Death, in one week. Yin Ping Yang, an 80-year-old Chinese woman, who was viciously attacked by intruder(s) in her Auckland home Wednesday, died from internal injuries Saturday. Other than being a Chinese, It’s not known what threat, if any, she might have posed to New Zealand “national security” or the “welfare” of the New Zealanders. The Auckland home of the 80-year-old Chinese elderly women who was viciously assaulted Wednesday was cordoned off. Photo: SALLY FRENCH/Stuff.co.nz. Image maybe subject to copyright. See New Zeelend Fair Use Notice! She may have escaped the fury of China quake, but the frail old grandma was no match for New Zealand’s racist storm! No worries, he was only a Japanese student! A Japanese student was killed after a car crash on New Zealand’s death roads, near Palmerston North last night. Why bother at all, Mr Mercer? Do you think Japanese parents give a damn about their kids? Why would they send them to New Zealand? Who is counting, anyway? Poor Jacek Grzybowski had no idea Mr Wolfie was waiting for him! Jacek Grzybowski, 28, a Polish computer software engineer visiting New Zealand was “zapped” by Mr Wolfie. Our thoughts go with Mr Grzybowski’s family and friends. No one deserves to be murdered or killed in the horrible way that the victims he and so many other tourists in New Zealand have been slain. This is outrageous, and it’s patently unacceptable. Do you believe Jacek Grzybowski was killed accidentally? No way! What are the probabilities that so many intelligent, healthy people could be “accidentally” killed in New Zealand? About one in 100 billion? [See all previous entries on this blog!] The families of the victims owe it to their loved ones to thoroughly investigate the killing, leaving no stone unturned until they establish the cause of death! LOVE LOST in New Zealand [AGAIN! ]: Piotr and Anna Grzybowski, the parents of Jacek Grzybowski. Isn’t it about time intelligent people stopped going to New Zealand? It’s no fun for your parents to take you home in a body bag! Would Mr Grzybowski have visited New Zealand, if the NZ government had revealed the country’s appalling record of tourist murders, killings and deaths? Thousands of mostly “colored,” immigrants, refugees, students and tourists from China, Hong Kong, India, Japan, Korea… are raped, mugged, seriously assaulted, violently murdered or killed on New Zealand’s death roads each year. The names and details of many of the victims are permanently suppressed. The Malevolent NZ Authorities are violating the tourists’ human rights and are party to the crimes perpetrated against them through concealment of death and injury statistics, misrepresentation of facts concerning safety, and negligence in failing to provide adequate care and protection for the visitors!